Many people think that hearing loss won’t have a big effect on their lives. Sure, it’s annoying to struggle through conversations, but people think that’s all there is to it. Sadly, hearing loss affects every area of your life, and is linked to social isolation, depression, more hospitalizations, lower activity levels, rapid cognitive decline, and even dementia. Risk factors for hearing loss include smoking, drinking, diabetes, and exposure to loud noise. A recent study explores the link between hypertension and hearing loss. Hypertension, or high blood pressure, is a major health concern among American adults. It’s one of the biggest risk factors for stroke and heart disease, and according to the Centers for Disease Control and Prevention, roughly 70 million people have hypertension! 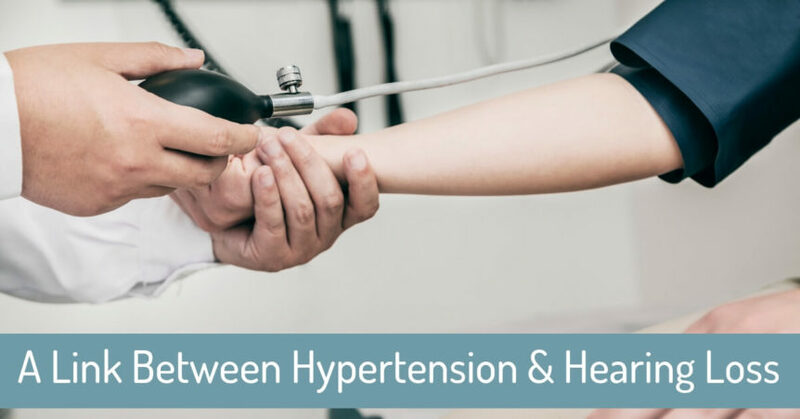 The CDC reports that on top of that, one in three Americans suffers from prehypertension, or somewhat elevated blood pressure levels that can easily cause other health concerns, or lead to high blood pressure. What exactly is high blood pressure? Blood pressure is the force your blood is placing against the walls of your blood vessels. It’s noted as two numbers. The top number represents the pressure when your heart pumps blood out, and the bottom number is the diastolic reading, or the pressure of the blood between heart beats when your heart isn’t actively pumping blood. High blood pressure means that your heart is pumping the blood through your veins very quickly, and with such high pressure than the blood vessel walls can be damaged. As the blood vessels are damaged, a buildup of fatty plaque can occur along the walls of the blood vessels, and this will eventually slow or stop the blood flow, causing a blood clot or stroke. Many people don’t realize they have high blood pressure, since it’s not a condition you can feel. Most people find out their blood pressure is abnormally high during their annual physical. Untreated hypertension can wreak havoc on your body. Blood vessels throughout the body can be damaged, and the delicate cells in the ear are particularly susceptible to the increased force. If you have high blood pressure, your hearing can be permanently damaged. If this is the case, not only do you need to treat your hearing loss, but you’ll need to treat the underlying cause as well, and take steps to lower your blood pressure to ensure that you won’t continue to damage your blood vessels, or risk more serious conditions such as a stroke. In fact, 8 out of 10 people experiencing a first stroke have hypertension, so it’s extremely important that you visit your doctor if you suspect high blood pressure. Have you recently experienced a sudden change in hearing? Hearing loss is often a gradual process, and it make take you months or years to realize you have hearing loss. If you have sudden hearing loss, it’s a sure sign that something isn’t right. Maybe you attended a loud concert without hearing protection, and this explains the sudden changes. However, your sudden hearing loss could be a sign of a deeper problem, such as an illness, infection, or changes in your blood pressure. Scientists say that if you experience sudden and severe hearing loss, you are 150% more like to experience a stroke within two years! That’s why is critically important to visit both your hearing specialist and your primary physician if you’ve noticed sudden changes in your hearing abilities. Whether you’re 35 or 65, it’s important to take steps to stay healthy. Keeping active and eating nutritious food will naturally lower your blood pressure and reduce your risk of diabetes. Make sure you schedule annual physicals with your family doctor, and be sure to include an annual hearing test to your annual checkups. Annual testing will allow you to monitor your hearing health and notice the moment anything changes. Do you have hearing loss? Whatever the cause, living with untreated hearing loss will decrease your quality of life, affect your relationships, and further damage your overall health. Call us today at Neighborhood Hearing Aid Center to start your journey towards clear hearing, and find out what hearing aids can do for you.